David Beckham may just be the best dad ever! And who knew he could sew? The 40-year-old soccer star recently meticulously sewed a doll dress for his four-year-old daughter Harper. 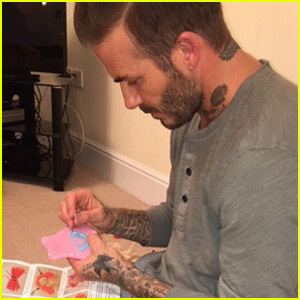 His wife Victoria took to her Instagram to share a photo of David in the process of creating the tiny dress. “Harper has daddy stitching her dollies dresses!!! We love you @davidbeckham ❤️ #lovingdaddy #proudmummy #familyfun 🙏🏻 x vb,” she captioned the adorable image. Mariah Carey Cancels Brussels Concert Due to Safety Concerns If You Bought One Of Those Canceled Meet And Greet Packages On Justin Bieber's Purpose World Tour, Don't Expect To Ever See Any Money Back! Sam Smith SHUTS DOWN Homophobia Online With Total Grace! See What He Said HERE! Miley Cyrus Plans On Ending The VMAs With A Bang — And 30 Drag Queens! Here Are The Deets For Sunday Night's Show! Bachelor's Nick Viall & Fiancée Vanessa Grimaldi Call It Quits On Their Engagement! Chrissy Teigen's 'Sports Illustrated' Cover Gets a Rice Krispies Replica! Zac Efron Shows More Skin Than Ever in 'Dirty Grandpa' International Trailer!